Felipe Massa is to return home to Brazil on Monday just nine days after fracturing his skull in a freak accident at the Hungarian Grand Prix. Massa is continuing to make a good recovery after having emergency surgery for life-threatening injuries he sustained in the horror crash last Saturday. The Ferrari ace was struck full on the helmet by a suspension spring that had fallen off the Brawn GP of fellow Brazilian Rubens Barrichello. He was knocked unconscious and his car hurtled into a tire barrier at 200kph in the final qualifying for Sunday’s race which was won by Lewis Hamilton, who pipped Massa to the world title last season. Operated on at the AEK military hospital in Budapest, Massa spent two days in a medically-induced coma, but since coming around has improved rapidly. His personal doctor, Dino Altmann, told reporters Friday that Massa had made rapid strides. “He is doing very well, and we have already decided to go back home on Monday to Sao Paulo.” Altmann said he would complete his recuperation at home rather than returning to Europe. “He is to continue his recovery and return to racing as soon as possible, that’s the plan,” added Altmann. 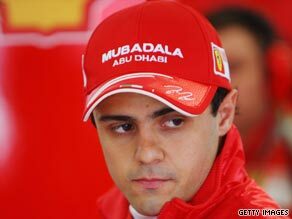 Early fears that Massa may have lost some sight in his left eye as a result of the accident appear to have receded, but he will be replaced at the European Grand Prix in Valencia in three weeks time by Michael Schumacher. Felipe Massa’s crash in pictures. » The seven-time world champion is barred from testing the 2009 Ferrari as part of the new Formula One rules for the season, but has had a run out at their Maranello center in the 2007 car. “Although the cars are not current or last year’s, I simply like to drive as much as possible, so it was a good option,” said the German. “The next weeks are totally about preparation.” Press Association reported that Ferrari have also written to the other nine teams on the grid to request that Schumacher be given a one-day test with this year’s car in a bid to get up to speed.